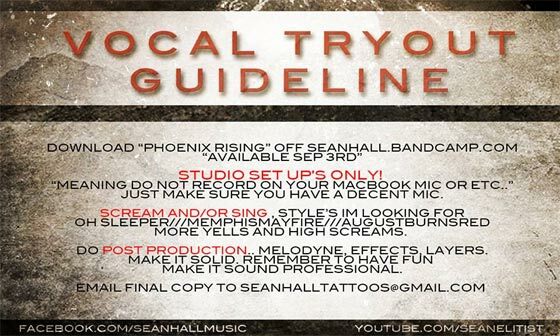 SEAN HALL “PHOENIX RISING” SINGLE / VOCAL TRYOUT! Our friend Sean Hall recently dropped a brand new single to follow up his mind ripping EP “Beneath The Solace” (read our review here). “Phoenix Rising” is an exceptional track providing a solid mix of modern metalcore with some progressive and light electronic elements. The more I listen to Sean Hall’s recent work, the more I get the impression that the “Caves” spirit of Elitist (his old band) that everyone was so stoked on left the band when he did. This is basically a extension of that magical sound, but instrumental and relatively more matured in some ways. Definitely music worth hooking your ears and brain on. What’s more? Sean Hall is holding tryouts in support of this new single. Looks like there will be voices included in his future works. He has invited vocalists to give it a go and record their best on top of this intense track. Check the first submission. Guidelines listed below the videos.